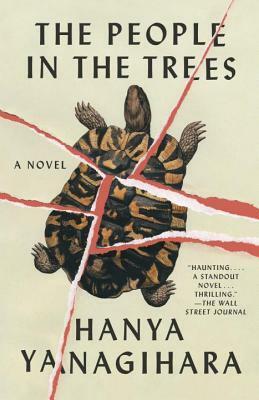 Hanya Yanagihara is truly a literary talent to watch for. The People in the Trees, her debut novel, is a disquieting, affecting, gorgeously written tale sprawling in both scope and ambition. In it, a Nobel Prize-winning scientist by the name of Norton Perina is accused of pedophilia and sexual abuse among the forty children he adopted (he would say rescued) from their island home. Prompted by a friend and colleague, Perina begins to tell his story (with helpful footnotes from the colleague for clarification). Perina first visited the island of Ivu’ivu in 1950 as a medical student on the brink of an average, unremarkable life. All that changed when Perina discovered that certain people on Ivu’ivu have achieved remarkable lifespans through consumption of an incredibly rare, sacred turtle living on the island. Unfortunately, these tribal people with such advanced ages are not all well–their brains still age at the normal rate and are subject to decay as time goes by. Perina recklessly steals some of the turtle meat to return to the United States and prove his findings to the world, making him wealthy, famous, and respected albeit controversial. You see, in publishing his findings Perina doomed the island of Ivu’ivu by thrusting it into the spotlight. In no time at all the island was modernized, its resources depleted, and its people left in poverty–unable to profit from the achievements others made from their property. By 1970, Perina began to adopt some of the children who had been ruined and left behind after everything that had happened, and it is here that the narrative takes a spellbindingly squirm-inducing turn, for we know where this situation is ultimately headed. To Yanagihara’s immense credit, even though we know the revelation ahead, it is every bit as impacting (and discomfiting) as it needed to be. Perhaps the most remarkable thing about The People in the Trees is that while most everything in it sprang from Yanagihara’s imagination, it all feels incredibly realistic. You truly believe that this island nation exists, that this sublime prose is describing an actual place and things that happened there. That says a great deal about Yanagihara’s promise as a writer. It has been reported that it took Yanagihara ten years to complete The People in the Trees. While the love and dedication shows, I hope that I don’t have to wait that long to find out where she goes next.